President Edgar Lungu has refused to fire infructracture development minister Ronald Chitotela to pave way for further investigations and prosecution following his arrest this week for corruption. President Lungu on Thursday said he considered Chitotela innocent unless the Ant-Corruption Commission (ACC) who arrested and charged him with two counts of concealing property suspected of being proceeds of crime contrary to Section 71 subsection (1) of the Forfeiture of Proceeds of Crime Act Number 19 of 2010 secured his conviction in the courts of law. “I think we are fighting corruption, so they will have to prove in the courts of law and I hope they give him a chance to prove himself if he is really corrupt but you see what I don’t want to do is to politicise the fight against corruption. 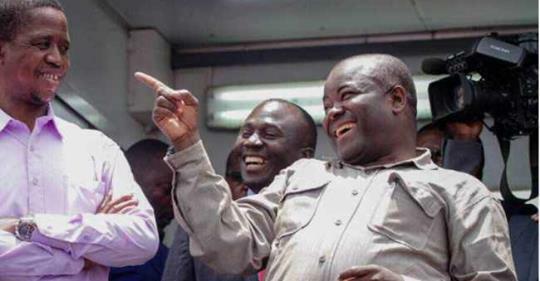 Remember how I lost Chishimba Kambwili, they came to me and said he was corrupt. I said investigate him, they investigated him and along the way they said he was not corperating. He is unsulting us, you know he is very vulgar, I am sorry to say that but he is vulgar and he can be vulgar. They were all crying in my office and I said what do I do? In my judgement, I said based on the basis of the reports I removed him. Chishimba up to now, we are still waiting for the ACC, DEC and all those who brought allegetions against him to prove their allegations in courts of law. So, you want me to lose Chitotela on that basis again? Im saying no, i will give them lee-way to investigate and arrest and bring to court culprits, but I will not interfere, I will even fund them to do their operations but those who are calling for the removal of honourable Chitotela now, I say no give me space to do my work. But I don’t interfere with the process. Bring your evidence and let him also have his in court and that is justice and if you look at the Bill of Rights I think Article 18 starts with presumption of innocence. So, as far as Iam concerned he is innocent. As far as Iam concerned, even Chishimba Kambwili is innocent but look at where Chishimba Kambwili is. No, Lungu is fighting Chishimba Kambwili but I never fought Chishimba Kambwili. What I had was a report from the law enforcement agencies saying that Chishimba had done 1, 2, 3 wrongs. We are investigating him like many others. I said go ahead and they went ahead but at a certain point they came back and said we can’t get anything, no corporation from him but I said what do I do?. In my wisdom I removed him from office. Having removed him from office, the rest is history. He pledged to work with us, the next thing he said was Lungu is corrupt. I don’t care what had happened, having lost Chishimba Kambwili through an allegation of corruption by the same forces, I don’t want to lose Chitotela in the same manner. Im saying may Chishimba Kambwili find justice, may Chitotela find justice. May all those alleged to be corrupt find justice because that is how the rule of law works. The presept of law, the respect of the rule of law, there is no one above the law. When the police feel like investigating you, they will investigate you. When they want to come to your house in the night to search, they will search and I can’t tell them go and search this individual because it is not in my mandate. So let us not politicise the fight against corruption. There is a perception that by doing what they are doing they are weakening Lungu, they are just killing the systems we created to fight corruption guinenly. So, what comment do you want me to make, may justice be done not that Iam fighting Chitotela because he knows too much about me. What have i done? No, Chitotela has got money on my behalf. No, Iam not a business man. Im just a politician who wanted to lead Zambia”.